For easy removal and insertion of discs into damaged belt areas and the production of circular blanks for repairs. The IPCO QuickDisc tool enables quick and easy removal of damaged areas in steel belts and the production of circular blanks for repair/replacement. The tool has been specifically designed for press belts used in the manufacture of wood based panels. Making use of a special cutting tool, the QuickDisc produces a clean-cut hole to such precise tolerances that no additional treatment – e.g. edge grinding – is necessary. Welding can be carried out with no distortion. One main aluminium body is equipped with suction cups and is designed to keep the steel belt flat. The suction cups are connected to compressed air, (6 bar, 600 l/min) which creates a vacuum against the steel belt. 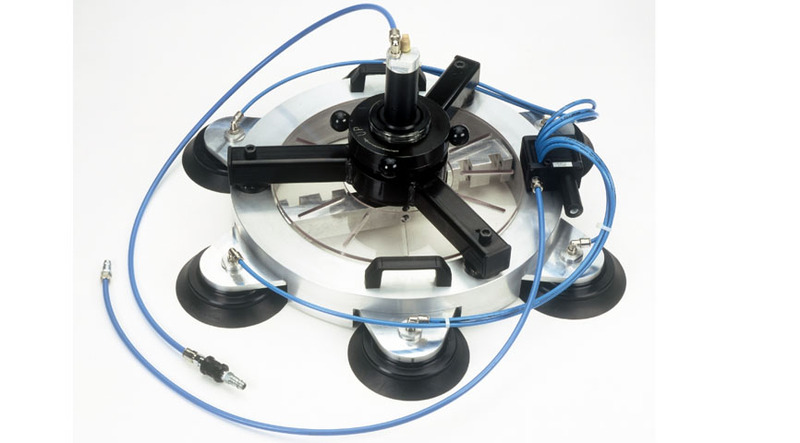 A rotating centre holds a trepanning tool, which is fed manually during cutting out of the damaged area (the centre unit operates pneumatically). The trepanning tool, with its axial cutting-off blade, is adjustable for diameters corresponding to IPCO clamping plates and the pneumatic clamping device used for the welding of the insert. The QuickDisc is also used for the manufacture of the circular blanks used to replace the cut out damaged area. Ideally, the circular blank should be produced beforehand to minimise production downtime. The circular replacement blank should always be made from a material of identical thickness and steel grade as the steel belt to be repaired. The welding operation, which is carried out by hand, should be made clockwise and from both sides of the steel belt.